Angus Thuermer Jr. arrived in Jackson Hole in 1974 to climb. “I stayed at the [Grand Teton] Climbers’ Ranch and when I ran out of money, I washed dishes at the Silver Spur and made beds at The Virginian,” he says. For four years, Thuermer was a climbing bum, migrating between the Tetons, the Wind River Mountains, Alaska, and Yosemite. To make money, he spent winters working on oil rigs all around Wyoming—near Kemmerer, Evanston, Bridger Valley, and Casper. 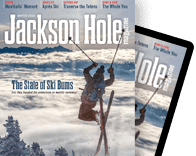 In 1978, right as Thuermer was fired from his oil rig there was an ad for a job as a pressman at the Jackson Hole News. He applied, thinking it’d be fine for one winter. And then the following spring, a reporting job opened up. “Both of my parents had worked for the AP [Associated Press] so that was a little intriguing and All the President’s Men was one of my favorite books at the time, so it sounded like a cool thing to do—and the job was asking questions on the part of the public,” says Thuermer, who had majored in English and wrote for the paper at Yale University. In the 1980s he was named the paper’s managing editor, and was its editor in chief by the early 1990s. Thuermer served as the latter until 2014, when he left to join WyoFile, a nonprofit that does in-depth, online reporting around the state (WyoFile.com), as its natural resources reporter. Q: Was leaving the newspaper a difficult decision? A: It was time for some other people to make the decisions about how to run the newspaper in this town. Plus WyoFile was an opportunity to do some reporting on a statewide scale that we couldn’t do at the News&Guide because we were restricted by county boundaries. It was a chance to paint on a bigger canvas. Q: What are the big issues affecting the state that you’re reporting on now? A: Drilling, water, and sage grouse. Coal’s fate has been decided. It will continue to be important to Wyoming, but we’re not going to have another coal boom. But natural gas, that’s growing and it’s pretty invasive and it’s going to run over sage grouse. And water—Wyoming is trying to figure out how to keep its share of water of the Colorado River drainage, but it doesn’t quite know yet how to develop it. Q: What were some of the biggest local issues you reported on at the paper? A: The fires of 1988 were a big deal—the debate about natural fire regime versus fighting fires. In the end they spent $100 million and brought in the National Guard, and it didn’t make a whit of difference. One September day it snowed, and that was the end of it. A: I was always interested in mountaineering and skiing news including rescues and avalanches. I knew enough about the mechanics to be able talk to the people involved and then to explain the circumstances to a larger audience with the hope that people could learn from others’ mistakes. Q: Do you think your reporting made a difference? A: I don’t know how much I had to do with it, but I think people are generally much more sensible and aware these days. There are also now institutionalized efforts to help people make better decisions in the backcountry like [Teton County Search & Rescue’s] Backcountry Zero. Q: It was climbing that first brought you to the Tetons. When did you start backcountry skiing here? A: About 1977. As editor, I’d take a lunch line—I’d leave at 11:30 and be back at 1:30. Q: How much did you ski Teton Pass last winter? Q: Did you realize when you took the pressman job that that was the end of your days as a climbing bum? A: I didn’t think it would end, and it didn’t absolutely in the beginning. I got a month off to go to Alaska to climb some absurd peak, but eventually the responsibility became too big to take that time off. Q: Are there still climbs out there that you wish you had done? A: A couple of thousand, sure.